The elements of group 13 have to two electrons in the s- orbital and one electron in the p-orbital of the valence shell. These elements are expected to show a uniform oxidation state of +3. Boron and aluminium which show an oxidation state of +3 only but gallium, indium and thallium due to inert pair effect show oxidation state of both +1 and +3 . As we move down the group, the stability of +3 oxidation state decreases while that of +1 oxidation state increases. The order of stability of +1 oxidation states increases in the order : Al < Ga < In < Tl. In gallium and indium +3 oxidation state is more stable than +1 oxidation state , therefore both Ga+ and In+ salts undergo disproportionation reaction in aqueous solution. Thallous compounds such as thallous hydroxide ( TlOH) and thallous perchlorate(TlClO4) are more stable than their corresponding thallic compounds. Due to lesser stability of , Tl3+ salts act as strong oxidising agent. The stability of +1 oxidation State increases down the group. Reason: As we move down the group, the tendency of s-electrons of the valence shell to participate in bond formation decreases. This reluctance of the s-electrons to participate in bond formation is called inert pair effect. The ns2 electron pair in gallium ,indium and thallium tends to remain paired. This is due to poor or ineffective shielding of the ns2 electrons of the valence shell by intervening d and f electrons. As the size of the atom increases from aluminium to thallium, the energy required to unpair the ns2 electrons is not compensated by the energy released in forming the two additional bonds. The inert pair effect becomes more predominant as we go down the group because of increased nuclear charge which outweighs the effect of the corresponding increase in atomic size. The s-electrons thus become more tightly held ,and ,therefore ,becomes more reluctant to participate in bond formation. Thus down the group , +1 oxidation State become more and more stable as compared to +3 oxidation state. 1) According to Fajan’s rule, the small size of the ions and their high charge of +3 , favour the formation of covalent bonds. 2) The sum of first three ionization enthalpies is very large. This also suggest that bonds will be largely covalent . 3) The electronegativity values of group 13 elements are higher than those of group 1 and 2 .When these elements react with other elements, the electronegativity difference will be small. This also favours the formation of covalent bond. 1) Boron because of its small size and high sum of first three ionization enthalpies, does not lose its 3 Valence electrons to form B3+ ions. It does not form ionic compounds. Instead , boron always form covalent compounds by sharing is valence . 2) As we move from Boron to aluminium, the sum of first three ionization enthalpies decreases and thus aluminium has only little tendency to form ionic compounds. It has a strong tendency to form covalent compounds. For Ex: AlF3 and Al2(SO4)3 are ionic while AlCl3 , AlBr3 and AlI3 are covalent. GaCl3 , InCl3 are covalent when anhydrous. Al , Ga , In and Tl all for metal ions in solution. The change from covalent to ionic nature occurs due to the reason that in aqueous solution , these ions are hydrated and the amount of hydration enthalpy released exceeds the ionization enthalpy. Gallium, indium and thallium show two oxidation states of +1 and +3 due to inert pair effect . Since the ions in the +1 oxidation state are much larger than the ions in the +3 oxidation state, therefore ,these compounds in +1 oxidation states are more ionic than in +3 oxidation state. In the trivalent state , most of compounds being covalent are hydrolysed by water to form either tetrahedral species, [M(OH)4]‾ in which the element is sp3 hybridized or octahedral species, [M(H2O)6 ]3+ in which the element is sp3d2 hybridized. BCl3 on hydrolysis forms tetrahedral [B(OH)4]‾ species because boron due to the absence of d – orbital cannot expand its covalency beyond 4. Al2Cl6 on hydrolysis give octahedral [Al (H2O) ]3+ species because Al due to presence of 3d orbital can expand its covalency from 4 to 6. In trivalent state , the number of electrons around the central atom in a molecule of these elements will be only 6 and thus behave as electron deficient molecules.They have a strong tendency to accept a pair of electrons to achieve the stable inert gas configuration and thus behave as Lewis acid. Boron and aluminium halides are Lewis acid but only aluminium halides exist as dimer whereas boron halides exist only as monomers. Reason : Boron atom is so small that it cannot accommodate 4 large size halogen atoms around it. All the metals of group 13 react with dioxygen at high temperature to form trioxide, M2O3. The reactivity of these elements towards dioxygen, however, increases down the group. Boron is unreactive in the crystalline form. Aluminium does not react with dry air. In moist air, its surface get tarnished due to the formation of a very thin oxide layer on the surface which protects the metal from further attack. Amorphous boron and aluminium metal on heating in air form boron trioxide. With dinitrogen at high temperature , this from nitrides. The remaining elements i.e. Ga, In , Tl do not react with the nitrogen to form the corresponding nitrites. Boron nitride is a white slippery solid. One boron and one nitrogen atom together have the same number of valence electrons as 2 carbon atoms. Boron nitride has almost the same structure of graphite consisting of sheets made up of hexagonal rings of alternate Boron and nitrogen atoms joined together. These sheets are stacked one on top of the other, giving a layered structure similar to that of graphite. It is because of the similarity of structure of boron nitride and graphite that boron nitride is also called inorganic graphite. The trioxides of group 13 react with water to form their corresponding hydroxides. The nature of these oxides and hydroxides varies down the group. B2O3 and B(OH)3 are weakly acidic. They dissolve in alkalis forming metal borates. On moving down the group ,the acidic character decreases and the basic character increases. Because down the group, ionisation enthalpy decreases. Consequently , M-O bond weakens and is easily broken resulting in increased basic strength down the group. The oxides and hydroxides of Al and Ga are amphoteric while those of indium and thallium or basic. Thallium forms two hydroxide : thallic hydroxide Tl(OH)3 and thallous hydroxide TlOH. Tl(OH)3 is insoluble in water but TlOH is soluble and is a strong base like alkali metal hydroxide. Being amphoteric ,alumina and aluminium hydroxide dissolve both in acids as well as in alkalies forming salts. Boron does not react with non- oxidising acid such as hydrochloric acid. It is attacked at high temperature by strong oxidising acid such as mixture of hot conc H2SO4 forming boric. All other elements react with both non – oxidising and oxidising acids. Aluminium reacts with dilute acids liberating hydrogen gas. With conc HNO3 ,aluminium becomes passive. This passivity is due to the formation of thin protective layer of its oxides on the surface of the metal which prevents it from further actions. Boron resists the action of alkalies upto 773 K but above this temperature, it reacts forming borates and liberating dihydrogen gas. It also dissolves in fused Na2CO3 / NaNO3 mixture at 1123 K.
Al and Ga being amphoteric also react with aqueous alkalies with the evolution of dihydrogen gas. In and Tl , however, do not react with alkalies. The elements of group 13 react with halogens at high temperature forming trihalides, MX3. Due to small size and high ionization enthalpy ,boron forms covalent trihalides. BF3 is a gas, BCl3 and BBr3 are liquids while BI3 is a solid. All these trihalide are planar molecules in which Boron is sp2 hybridised. 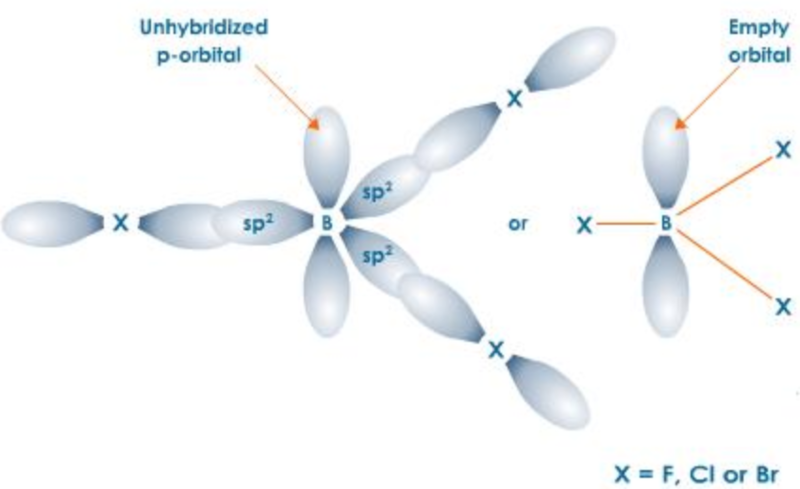 The three half filled p-orbitals ,one on each halogen ,overlap along their internuclear axis with 3 sp2– orbitals of Boron to form 3 sp2-p , C-X σ bond.The unhybridised p-orbital is, however,empty. Order of acidic strength can be easily explained on the basis of the tendency of the halogen atom to back donate its lone pair of electron to the boron anatomy through pπ-pπ bonding. The back bonding in BF3 molecule is supported by the fact that the observed B-F bond length in BF3 molecule is much less than the sum of their covalent radii. As a result of pπ-pπ back donation and resonance, the electron deficiency of Boron decreases and thus BF3 is the weakest Lewis acid. As the size of the halogen atom halogen atom increases from Cl to Br to I ,the extent of overlap between 2p orbital of Boron and a bigger p-orbital of halogen decreases and consequently the electron deficiency of Boron increases and thus the Lewis acid character increases accordingly from BF3 to BCl3 to BBr3 to BI3.